Reading and share top 27 famous quotes and sayings about Destinations And Journeys by famous authors and people. Browse top 27 famous quotes and sayings about Destinations And Journeys by most favorite authors. 1. "Nowhere was the airport's charm more concentrated than on the screens placed at intervals across the terminal which announced, in deliberately workmanlike fonts, the itineraries of aircraft about to take to the skies. These screens implied a feeling of infinite and immediate possibility: they suggested the ease with which we might impulsively approach a ticket desk and, within a few hours, embark for a country where the call to prayer rang out over shuttered whitewashed houses, where we understood nothing of the language and where no one knew our identities. The lack of detail about the destinations served only to stir unfocused images of nostalgia and longing: Tel Aviv, Tripoli, St Petersburg, Miami, Muscat via Abu Dhabi, Algiers, Grand Cayman via Nassau … all of these promises of alternative lives, to which we might appeal at moments of claustrophobia and stagnation." 2. "In Pliny I read about the invention of clay modeling. A Sicyonian potter came to Corinth. There his daughter fell in love with a young man who had to make frequent long journeys away from the city. When he sat with her at home, she used to trace the outline of his shadow that a candle's light cast on the wall. Then, in his absence she worked over the profile, deepening, so that she might enjoy his face, and remember. One day the father slapped some potter's clay over the gouged plaster; when the clay hardened he removed it, baked it, and "showed it abroad" (63)." 3. "I relate to Nora's transformation in Henrik Ibsen's 'A Doll's House,' and I also relate to both sisters' journeys in John Madden's film 'Proof.'" 4. "People who've never read fairy tales, the professor said, have a harder time coping in life than the people who have. They don't have access to all the lessons that can be learned from the journeys through the dark woods and the kindness of strangers treated decently, the knowledge that can be gained from the company and example of Donkeyskins and cats wearing boots and steadfast tin soldiers. I'm not talking about in-your-face lessons, but more subtle ones. The kind that seep up from your sub¬conscious and give you moral and humane structures for your life. That teach you how to prevail, and trust. And maybe even love." 5. "Don Quixote is one that comes to mind in comparison to mine, in that they both involve journeys undertaken by older men. That is unusual, because generally the hero of a journey story is very young." 6. 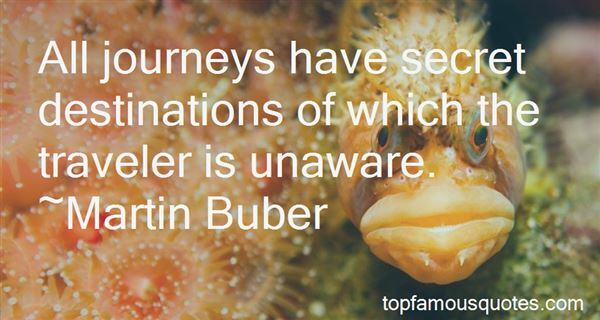 "Martin Buber said, 'All journeys have secret destinations of which the traveller is unaware." 7. "I don't think you lose anything by hallucinating. It's cheaper than airfare, the destinations more interesting, and I'd rather have a mutant squid on my window than the State Department trying to do foreign affairs." 8. "Wealth ... or death. Those were the choices Gateway offered. Humans had discovered this artificial spaceport, full of working interstellar ships left behind by the mysterious, vanished Heechee. Their destinations are preprogrammed. They are easy to operate, but impossible to control. Some came back with discoveries which made their intrepid pilots rich; others returned with their remains barely identifiable. It was the ultimate game of Russian roulette, but in this resource-starved future there was no shortage of desperate." 9. "Some individuals have the courage to make it, even feel the need to do so; for them the quest is a necessity, not an option. Most people setting out on such journeys are never heard from again, but part of the romance of any field lies in keeping the dream alive, in not settling for what is familiar and comfortable." 10. "Why do you think the old stories tell of men who set out on great journeys to impress the gods? Because trying to impress people just isn't worth the time and effort." 11. "He was thinking of that time, the way one does on long journeys when rootlessness and boredom, lack of sleep or routine can summon from out of nowhere random stretches of the past, make them as real as a haunting. --Solar"
12. "At night in this part of the West the stars, as I had seen them in Wyoming, were as big as Roman Candles and as lonely as the Prince who's lost his ancestral home and journeys across the spaces trying to find it again, and knows he never will." 13. "The passion for travelling is, I believe, instinctive in some natures. We have seen men persevere in their enterprises against the most formidable obstacles; and, without means or friends, and even ignorant of the languages of the various countries through which they passed, pursue their perilous journeys into remote places, until, like the knight in the Arabian tale, they succeeded in snatching a memorial from every shrine they visited." 14. "When you have been with your partner for so many years, they become the glove compartment map that you've worn dog-eared and white-creased, the trail you recogonize so well you could draw it by heart and for this very reason keep it with you on journeys at all times. And yet, when you least expect it, one day you open your eyes and there is an unfamiliar turnoff, a vantage point taht wasn't there before, and you have to stop and wonder if maybe this landmark isn't new at all, but rather something you have missed all along." 15. "My family's story isn't special. What's special is the America that makes our story possible. Ours is a nation like no other, a place where great journeys can be made in a single generation. No matter who you are or where you come from, the path is always forward." 16. "While railing against the manufactured prerequisites of womanhood or manhood, we need to avoid manufacturing our own prerequisites. The non-operative journey and the objection to it illustrate just one area in which we need to open our thinking to other journeys while expecting that others respect our own. - Mercedes Allen"
17. "Shakespeare's frequent horseback journeys from London to Stratford, and from Stratford to London, must have made him familiar with the county of Oxfordshire." 18. "An unanticipated destination, perhaps, but you must admit,all the best journeys take unexpected detours." 19. "People were used to those slow human speeds on both land and sea, to those delays, those waitings on the wind or fair weather, to those expectations of shipwreck, sun, and death. The liners the little white girl knew were among the last mailboats in the world. It was while she was young that the first airlines were started, which were gradually to deprive mankind of journeys across the sea. (The Lover)"
20. "All journeys have secret destinations of which the traveler is unaware." 21. "The days aren't discarded or collected, they are beesthat burned with sweetness or maddenedthe sting: the struggle continues,the journeys go and come between honey and pain.No, the net of years doesn't unweave: there is no net.They don't fall drop by drop from a river: there is no river.Sleep doesn't divide life into halves,or action, or silence, or honor:life is like a stone, a single motion,a lonesome bonfire reflected on the leaves,an arrow, only one, slow or swift, a metalthat climbs or descends burning in your bones." 22. "Every concert pianist knows that the surest way to ruin a performance is to be aware of what the fingers are doing. Every dancer and acrobat knows enough to let the mind go, let the body run itself. Every driver of a manual vehicle arrives at destinations with no recollection of the stops and turns and roads traveled in getting there. You are all sleepwalkers, whether climbing creative peaks or slogging through some mundane routine for the thousandth time. You are all sleepwalkers." 23. "Ayahuasca ceremonies are usually very structured rituals where the shaman or shamana holds the space and guides the drinkers on their journeys of discovery. The shaman is not just administering the hallucinogenic brew; he or she is also calling in their allies, banishing evil spirits, and safeguarding their immediate physical environment–playing the role of psychic bouncer. And while personalities vary, the role of the shaman in anchoring the physical and spiritual worlds is inviolate, and should be treated with respect." 24. "Everyone's life is an evolution of emotions, spirit and beliefs. The storyline changes, plots thicken, main characters mature and new spiritual journeys begin. This is true of inspirational authors. Their books represent only the stages of their life. New triumphs of the soul have yet to be written!" 25. "Previous journeys in search of treasure have taught me that a zigzag strategy is the best way to get ahead." 26. "Submissive men, men who desire to serve as consensual slaves, are on one of the most difficult journeys in the world today, because they have rejected patriarchal privilege and embraced their own heart's calling instead." 27. "Jungians such as Joseph Campbell have generalised such journeys into a set of archetypal events and images. Though they can be useful in criticism, I mistrust them as fatally reductive. "Ah, the Night Sea Voyage!" we cry, feeling that we have understood something important — but we've merely recognised it. Until we are actually on that voyage, we have understood nothing." There will be sleeping enough in the grave."